The Villa Sophia - LA Weekly's 'The Best Place to Pretend You're a Celebrity for a Day". This sumptuous, cozy and elegant GUEST HOUSE is like a private spa suite at a five star hotel, except that you have the hotel to yourself! Bright, sunny and spacious, the GUEST HOUSE overlooks a huge, private, 8' deep emerald tiled swimming pool to views of the downtown Los Angeles skyline, rolling yellow hills to the east and city lights. You will be surrounded by the lush garden grounds of an enchanting and historic, 1927 Old Hollywood, Los Feliz Hills estate that rests high upon 15' castle walls all around. One of the most filmed and photographed locations in Hollywood. Used often as an "Italian Villa" in films. Located in Central Los Angeles near to Griffith Park and the Griffith Observatory. Walking distance to the Greek Theater. Views are reminiscent of Tuscany looking east from bed. Enjoy number one rated Acqua di Parma hotel amenities and deluxe Italian linens by Rivolta Carmignani. Truly the finest luxury accommodations in Los Angeles. Totally private, peaceful and tranquil. Secluded in the exclusive, celebrity filled Los Feliz Hills neighborhood. Mountains and Pacific Ocean visible from property. Located on a small, hidden cul de sac for added privacy. 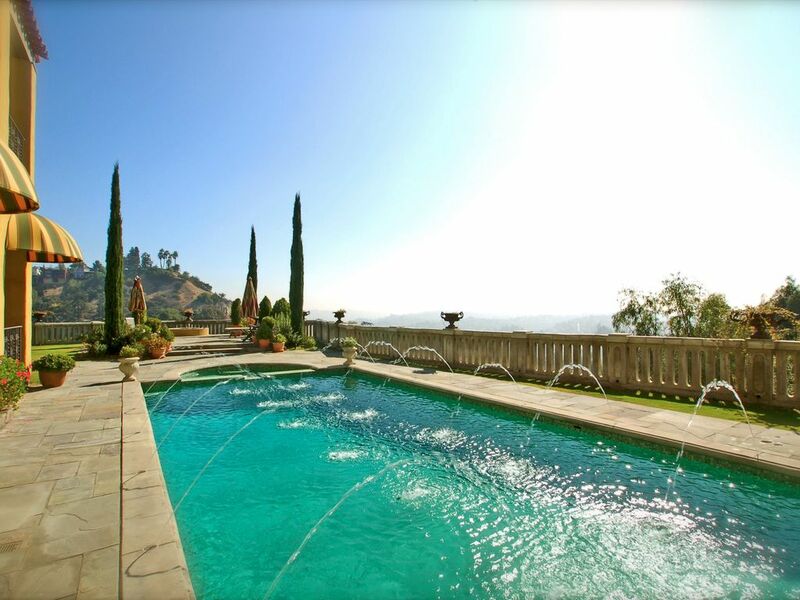 Luxurious and private, this Hollywood Hills designer GUEST HOUSE was built in 2005. It does not get any better than this. Sublime and surreal. Magical. The Villa Sophia is occasionally used for still photography, filming and very rarely, special events. Any photography/filming/event in the guest designated areas of the estate on any day during the renter's stay entitles renter to compensation as outlined in the rental agreement. Renter will receive $50/hour with a $250/day maximum. This does not include shoots already scheduled, which we would inform you of when you book. In the case of a shoot, you will not be disturbed in the guest house and you may come and go as normal. Acqua di Parma Hotel Amenities: ACQUA DI PARMA amenities are provided to guests: bar soap, glycerin soap, shampoo, conditioner, body lotion and shower gel. The Italian luxury perfume maker's prestigious hotel amenities line is inspired by the brand's flagship scent, Colonia. Created exclusively for only the most elegant 5/7 star luxury hotels and resorts worldwide. Reminiscent of Italy, Colonia amenities have a light, fresh and crisp fragrance containing Sicilian citrus, lavender, rosemary, verbena, Bulgarian rose, sandalwood, vetiver, cedar and ylang-ylang. The line is suitable for both men and women. I am a single man who lives alone in the main house. The property is big enough so that guests and owner's paths rarely cross...although I am available at all times for any reason necessary. Peace and tranquility with views, all day sunshine, ocean breezes in total luxury. toilet, shower, bidet, Luxury Spa type bathroom of marble, stone, tile w chaise. Romantic spa like bathroom with double bathroom sinks made of copper, huge stone/marble shower room with rain shower head, additional side mounted and hand held shower heads, double steam units with marble seating for 4, chaise lounge chair, laundry basket, two Hammacher Schlemmer terrycloth bathrobes and HAMMACHER SCHLEMMER Turkish towels, limestone/tile floors, marble counter-tops, generous space with custom cabinets of reclaimed wood, plentiful pool and bath towels. Toilet and bidet in separate water closet. waterproof shower radio. AQUA DI PARMA hotel amenities - shampoo, conditioner, body wash, body cream, glycerin soap and bar soap. The Villa Sophia has straight on views of the downtown Los Angeles skyline. The Villa Sophia has the feel, ambiance and amenities of a spa resort. While The Villa Sophia is located in the city of Los Angeles, it is also on the edge of the 4300 acre Griffith Park. The Guest House sits on a promontory surrounded by open space and woods. The Villa Sophia is a one mile walk to Los Feliz Village. ​Roosevelt Municipal Golf Course is a picturesque executive 9-hole course located across the street from the Greek Theatre. It is walking distance and can be seen from The Villa Sophia. The Villa Sophia has views of the rolling hills to the east. The view is reminiscent of Tuscany. Large stone fireplace. Gas powered. We are near the end of a dead-end street with plenty of street parking. The Villa Sophia has no driveway as we are located 45 steps up from the street below. Please park on the uphill side of Villa. Sub Zero under counter fridge, freezer and ice machine. Small fold up dining table for inside the Guest House and a large poolside dining table outside. Miscellaneous children's toys mostly for the water left by prior guests. 25 or so movies library. There are 2000 square feet of stone and terra cotta terraces in the guest house area surrounding the pool. This includes a three different covered sitting areas. Steam shower room with 2 steam generators. This is a favorite feature of The Villa Sophia guests. If you toggle back and forth between the 2 steam units you can continuously steam shower for hours. Brand new surround sound stereo system, Ipod dock, DVD/CD player, Playstation, 40' flat screen TV w/ cable T.V., 488 channels. NESPRESSO machine with complimentary coffee capsules, King sized bed. hair dryer, hair straightening iron, iron and ironing board, steamer, Pilates magic circle with workout DVD, Yoga mats, blocks, strap and eye pillow, aqua fitness swim gloves, jog belt and barbells. ACQUA DI PARMA soap, lotion, shampoo, conditioner and bodywash provided. Complimentary Nespresso capsules, milk, wine, bottled water. Wireless and direct connect high speed internet hub. Cell phone booster and free land-line telephone, wireless waterproof shower speaker with dock transmitter, sleep masks, printer and copy machine. Hammacher Schlemmer towels. Goown pillows and duvet. All bed linens are from luxury Italian manufacturer RIVOLTA CARMIGNANI. Sheets, pillowcases and duvet cover are 300TC mercerized, Egyptian cotton satin. Separate 500 sq. ft. tiled grotto seating area. do yourself a favor. book it! Gorgeous property in stunning location. Views are spectacular. Although it is a guest house, it feels very private. Tim is a great host. Couldn't ask for anything more. Will definitely book again. Breathtaking! Fantastically thoughtful level of detail to insure a truly enchanting experience! We cannot wait to return. I literally would consider changing my dates if it made staying at Villa Sophia again possible as opposed to trying to find another option in the region. I'm afraid the bar has been set so high that I would not be as happy with any alternatives that I looked at. Villa Sophia is is incomparable in my eyes. Thank you Tim for your warm hospitality and vision to have created such an amazing offering. We look forward to working with you again soon! Aloha and A Hui Hou!!! My husband and I spent a week at the Villa Sophia for our 20th Anniversary. We can’t express how beautiful the Villa, pool and gardens are. The views are absolutely amazing! The bed and pillows were extremely comfortable, and there are no words to describe how nice the pool and hot tub are. Tim was very accommodating, and Sophie was a welcome addition to our stay. We didn’t want to leave. Thank you Tim for sharing your beautiful Villa with us! We will definitely be returning!! No complaints what so ever and we highly recommend here to anyone that wants to have a nice peaceful stay but still wants to be close to just about everything going on in Hollywood. Tim thanks again for the wonderful accommodations. The guest house is large (750 sq. ft. or 70 sq. meters) but only has one king size bed. We charge $75/night for each additional person/child. There is a rollaway bed for extra guests. There are Full (54” wide) and Twin (39” wide) inflatable beds as well. There is a crib for infants.